First time home buyers, Karen and Kyle, had recently got engaged and were looking for their first home to move in and start the next chapter of their lives. Originally, Karen and Kyle had intended on purchasing a home closer to town. After looking at a few town home properties within their price range, they realized that the older properties in town did not appeal to them and that they desired a single-family home. 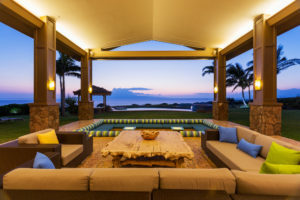 Gabrilyn realized that their money could go further by purchasing a brand new single-family home in Kapolei, even if it meant compromising on their originally desired location. She also knew that they would appreciate being able to customize their dream home by selecting their counter tops, flooring, appliances, etc. – something that only a new development in Kapolei would allow. Due to the popularity and “first come, first served” policy of these new development homes, Gabrilyn knew that securing a home in this up-and-coming neighborhood would not be easy. She has experienced first-hand that prior to a new sales release, prospective buyers would camp out overnight in front of the sales office in order to secure a home for themselves. The chances of securing a home would be slim, particularly so because Karen and Kyle had their eyes on one particular model type. In each sales release, only 2 of these particular model types would be available. Karen and Kyle had fully prepared themselves to camp out the night before a sales release. Fortunately, this was not the first new development sale in this neighborhood for Gabrilyn. She had a great working relationship with the sales developer and mentioned to him that her clients were looking to purchase a specific model type in the neighborhood. As fate would have it, the sales developer mentioned that one of the sales from their desired model type seemed to be falling out of escrow and that Gabrilyn’s clients could be the backup buyers for the property, if they wanted it. And of course they did! If it were not for Gabrilyn’s knowledge and experience of these new developments in Kapolei, her clients may not have gotten their dream home. Due to the clients selecting Gabrilyn as their real estate professional, they got the home they wanted at the right price, with the right terms, within the right time frame. And the biggest bonus of all, her clients did not have to camp out just to get a chance at the home they wanted! Gabrilyn’s ability to articulate the needs of her clients, and her experience, helped her to find the right home for Karen and Kyle and she can certainly do the same for you. Congratulations to our clients on your new home! Our agents are friendly, highly experienced, and dedicated to helping you achieve your desired lifestyle. Whether buying or selling, Gabrilyn can get the job done. Call or text Gabrilyn at (808) 220-8527 for an Exclusive Spring Market analysis.